The Fattening Room is an aged old tradition of the Efik people of Calabar, which has been greatly modified for today's generations. This ancient tradition is the training given to young women while they are in seclusion to prepare them for marriage and womanhood. 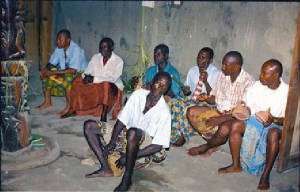 During this period the girl is being cared for by older women and is not allowed to come in contact with other people. She is put in a room where on a daily basis, is massaged three times, fed about six large portions of food (like poridge ekpang, plantain, yam fufu and assorted pepper soups), drinks three pints of water three times and gets plenty of sleep. This process ensures the bride gets a healthy waistline. According to the Efik people, they believe a woman who is full figured with a healthy waistline is beautiful. In the Fattening Room the girl goes through domestic training of home economics (like cooking and housekeeping), childcare and how to respect and make her husband to be and his family happy. The older women give advice about their experience in marriage to ensure a successful one. 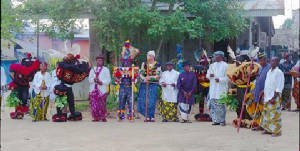 Another important parts of Efik cultural training are the cultural dances (Ekombi), folklore, folktales, songs and other forms of entertainment. Skills in artistic designs on Calabash and other materials are taught as well. All this to prepare her for marriage and womanhood. At the end of the seclusion period, people all over are invited to witness the graduation ceremony to honor her success in passing through this ordeal. 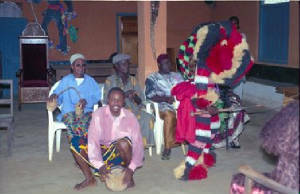 This ceremony is celebrated with traditional Efik dances (Ekombi) and other forms of entertainment. This big feast and merriment continues through out the whole day and night as families, friends and well wishers express their joy and happiness with gifts and donations to the bride. Finally she and her future husband embraces and dances welcoming everybody that have come to join the celebration. Everybody cheers the happy couple. 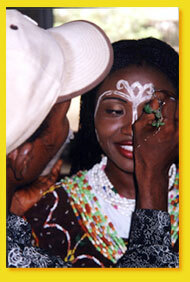 The face and body painting with Ndom among the Efik people symbolizes purity and love. In the old days it was a form of self-expression where personal identities or pattern were developed and recorded. These patterns came from various families and have developed into family identities. In some occasions the painting of face or body with Ndom is an expression of joy of birth of a child or any other good news the family might receive. The painted face is also an indication that the bearer has been initiated into all women society. The Abang dancers wear face painting for personal expression of beauty, femininity and love. 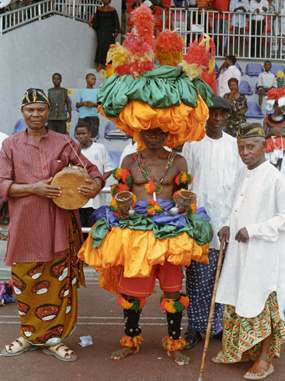 The Efik people from the Cross River State in Nigeria perform this "Abang" dance. The word "Abang" means, "pot" symbolizing fertility. Originated from the worshiping of the water goddess Ndem, this dance is also a tribute and celebration of respect and gratitude to the earth goddess Abasi Isong, who is credited for the abundance resources, fertile land for growing crops and clay for pottery. Abang dance displays beauty and femininity emphasizing on flexibility and grace. It is a dance of space, rhythm and unity that attracts and holds the attention of the audience, giving them the appearance of lightness and balance. Lead dancers always wear a headgear decorated with vibrant colors of red, green and yellow raffia called Ibuot Abang. Sometimes these are decorated with bird feathers that are placed in five formations attached to the flexible stems made out of cane called Basinko giving flexibility. Several silk scarves and handkerchiefs are hung from the basinko for the lead dancer to hold on to for support. While the Abang dancer bears the Ibout Abang she undergoes some degree of transformation, taking on the spiritual and physical responsibility of representing the Ancestors or Spirits. During this time she remains silent for the duration as she carries the Ibout Abang. As part of her costume, her neck is adorned with elaborate colorful beads called Nkwaesit Itong. Across the shoulder she wears bright coral beads called Anana Ubok as her arms are covered with colored raffia called Ekpaku Ubok. 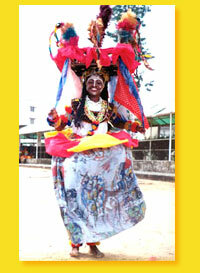 Her legs are also covered with raffia and bells called Mkpat Etim. 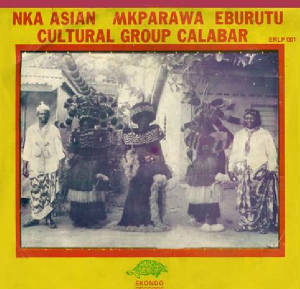 The dancer wears around the waistline an Akasi made out of cane. This symbolizes the ideal beauty of an Efik woman full figured with a healthy waistline. 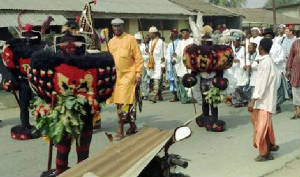 The Akasi is covered with a large piece of fabric to show beauty, femininity and grace as the dancer moves their body. 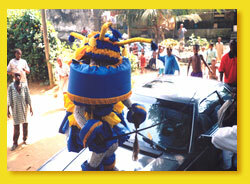 Masquerades are one of the oldest traditional and cultural events through out Africa . It is accompanied with chant, songs and dances. 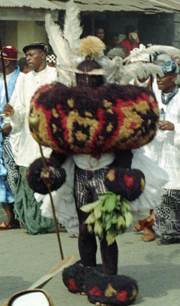 This important occasion is very popular among the Efik people in Cross River State as its' roots are deep in the traditional religion. 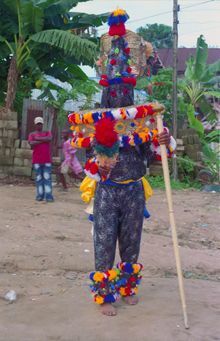 There are different kinds of Masquerades for various events like the coronation of the Obong (king of Calabar), burial, Chieftency and other seasonal celebrations and ceremonies. 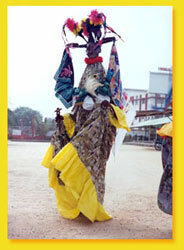 The most distinguished and highest of all other masquerades is the Ekpe Masquerade. Its' members are only men and is played on special occasions. 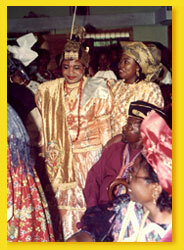 The Efik traditional attire is very elaborate and colorful. The women dress like queens and princesses wearing long flowing gowns, adorning their necks with colorful coral beads and wearing traditional made beaded shoes. They carry beaded handbag while some wear a headdress to match their outfit. The men wear white shirts over a colorful wrapper tied around their waist. 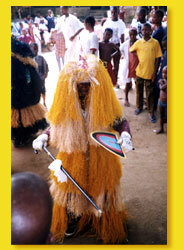 They also hang a long piece of cloth on their neck called Okpomkpom in addition to beaded shoes and a cap. 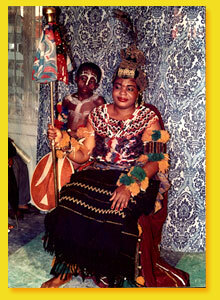 The artistic culture of the Efik people belongs mostly to the women since the are naturally artistic. The art of calabash carving and brass carving with brasstray decoration are still a big part of the women culture. This art is being handed down to the younger generation. Other artistic works by the women are beadwork like beaded shoes, hand bags and the special chewing stick bag called Ekpat okok. There, is also raffia and mat weaving basket making, woodcarving and cane making which are done by the men.